We talk a lot about the usefulness of curtains in the home. We have talked about using our curtain tracks to create privacy in bunk beds, and we have touched here and there on outfitting home-away-from-homes, such as RVs. But we haven’t yet highlighted how our curtain tracks will aid you in all things marine-related. Grab your lifejacket, we’re about to dive in: Our tracks can be found on fishing vessels, commercial ships, yachts, or any other maritime mode of transportation in which multiple people will be sharing space and/or sleeping. Having some privacy is a basic human need, and for those who go to sea for months at a time and share living quarters with others, even the space of a small berth can seem like paradise. A well-placed curtain track, such as our 32124 Low Profile Ceiling Track, will allow the installation of a privacy curtain that leaves no open space above or below, providing complete privacy. Of course, no flimsy sheer will work in this setting. Our Bunk Bed Privacy Curtains are made from Eclipse fabric that blocks 98% of light, is fire retardant per NFPA 701 standards, and is machine washable. In other words, no one is going to see through it, and you can block out the sights, and at least some of the sounds, of the ship. You can even catch some shuteye in the middle of the day. 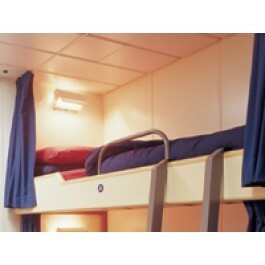 Curtains aren’t limited to use on bunks or berths. Curtain tracks can be installed into the ceiling to create a door or virtual wall in the living quarters of any ship or vessel. They create a space-efficient divider that can be opened or removed easily as needed. These panels include durable snap tapein the header, which snaps into any of RECMAR's snap carriers. Because the curtain unsnaps when pulled, it eliminates damage to the curtain and/or drapery hardware due to rough seas. It also makes removing for cleaning a "snap." We can custom make privacy curtains to your specifications and color preferences. We even have colors other than navy! Call our sales staff for help: 888-434-7444.